$130.00 Membership Badge of the Association of Veterans of Foreign Intelligence Service, early 1990s. The badge was awarded starting from 1991 for several years after the collapse of the USSR. Miniature or lapel format but very nicely made, mint marked piece of the same design as the larger 1991 badge For Service in the SVR Foreign Intelligence. $250.00 Medal for Distinguished Service in Foreign Intelligence Service of Russian Federation (SVR), 3rd cl., circa late 1990s. Mint marked "MMD". A very scarce official espionage award in outstanding condition. $35.00 Foreign Intelligence Service (SVR) Medal of Labor Distinction, circa mid to late 2000s. Awarded to SVR employees for no less than 15 years of irreproachable service. Near mint condition. 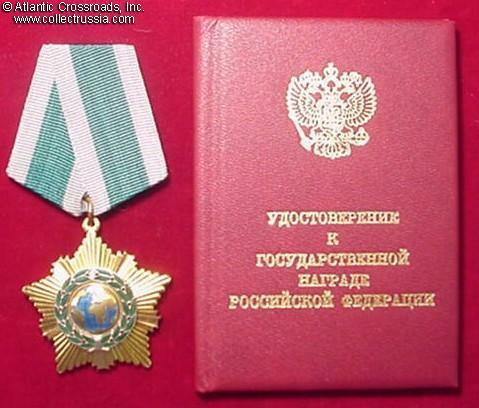 $15.00 Medal for Distinguished Service, Ministry of the Interior of Russian Federation, 2nd cl. $25.00 Medal for Distinction in Liquidation of the Consequences of Emergency Situations, MChS (Ministry of Emergency Situations) of Russia. Official medal of the MChS established in 2005. In near mint condition. $140.00 Medal of Honored School Teacher of RSFSR, transitional post-Soviet issue, 1992-1995. An interesting award of the early Yeltsin era. In near mint condition. $35.00 Award Badge for Service in the Caucasus, early to mid-1990s. This relatively scarce award was issued on behalf of Border Guards (FPS) command to both border troops and regular army personnel for outstanding service in combat zone during the First Chechen War. In excellent condition. $10.00 Marshal Zhukov Centenary Medal, Leningrad Mint issue, 1996. In pristine, near mint condition. $4.00 Medal for 50th Anniversary of Victory over Germany. Shows fireworks over Kremlin, Order of the Patriotic War, and dates "1941-1945". Veteran's award. $5.00 Unissued certificate for the Medal for 65th Anniversary of Victory over Germany. Serially numbered document for official WW2 Veteran's award. $25.00 Medal for 10th Anniversary of the Soviet Withdrawal from Afghanistan, 1999. In very fine to excellent condition. $4.00 Unissued award certificate for Medal for [Communist] Party Valor. Alternative medal. $9.00 55th Anniversary of Victory over Germany. One of the alternative medals. Excellent condition. $19.00 Medal for 65th Anniversary of Victory in the Great Patriotic War. Brass, enamel. Privately produced "Alternative" medal. $4.00 Unissued award certificate for a medal commemorating the 65th Anniversary of Victory over Germany. One of the alternative medals. Design based on the Order of the Patriotic War. $19.00 Medal to a Veteran-Internationalist, est. 1998. Reverse shows the list of faraway places were Soviet troops got involved over the years: Spain, North Korea, Cuba, Middle East, Vietnam, Afghanistan. $4.00 Unissued award certificate for Veteran-Internationalist Medal (alternative award). $14.00 Medal for 80th Anniversary of the USSR Border Guards. Shows profiles of two border guards and motto "Borders of the USSR are Sacred and Untouchable". $4.00 Unissued award certificate for Alternative Medal for 80th Anniversary of the USSR Border Guards. $4.00 Unissued award certificate for Medal for 80th Anniversary of the October Revolution. $25.00 Medal for 80th Anniversary of the October Revolution. One of the Alternative medals. $4.00 Unissued award certificate for Medal for 90th Anniversary of the Great October Socialist Revolution. Alternative medal. $25.00 VLKSM 80th Anniversary Medal. One of the "alternative" medals. Shows flag with Lenin's profile. $20.00 Medal for 90th Anniversary of the VLKSM. Brass, enamel. Alternative medal produced by the Communist Party of the Russian Federation. $16.00 Admiral Kuznetsov Alternative Medal. Brass, enamel paint, 2-piece construction. Reverse shows a Hero Star. $14.00 Soviet Nuclear Industry 50th Anniversary Medal. Brass and enamel, 2-piece construction. Medallion shows bust of Kurchatov (father of Soviet nuclear bomb) and on reverse Soviet atomic icebreaker Lenin. $4.00 Unissued award certificate for Medal for 50th Anniversary of Soviet Nuclear Industry. $10.00 Medal for 80th Anniversary of the Soviet Armed Forces, 1998. Alternative medal. $20.00 Medal for 90th Anniversary of the Soviet Armed Forces. Brass, enamel. Alternative medal produced by the Communist Party of the Russian Federation. $4.00 Unissued award certificate for Medal for 90th Anniversary of the Soviet Armed Forces. Alternative medal. $25.00 Soviet Airborne Troops 70th Anniversary MedalReverse shows motto "Nobody but Us", and dates "1930-2000". "Alternative" medal. $4.00 Unissued award certificate for Medal for Soviet Airborne Troops 70th Anniversary. $19.00 KGB 80th Anniversary Medal. Shows portrait of Felix Dzerzhinsky - the founder of Soviet secret police. Inscribed, "Honor of the Soviet People". $19.00 Stalin 120th Anniversary Medal, 1999. Modeled from the Soviet Lenin Centenary Medal. Shows Stalin's profile. $4.00 Unissued award certificate for Stalin 120th Anniversary Medal. $4.00 Unissued award certificate for Memorial Medal for 130 Years of Stalin's Birthday. Alternative medal based on the design of the Order of Lenin. $4.00 Award Document for the Medal for 130th Anniversary of Stalin's Birth. $4.00 Unissued award certificate for Medal ("Breast Badge") Commemorating the 130th Anniversary of Stalin's birth. $4.00 Unissued award certificate for Medal for 140th Anniversary of Lenin's birth. Alternative medal produced by the Communist Party of the Russian Federation.